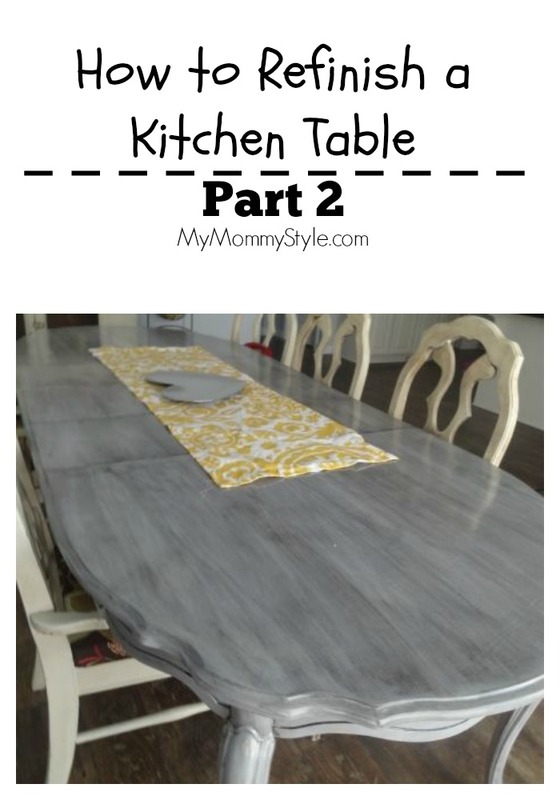 Ready for part 2 of how to refinish a kitchen table? This part was a lot of fun, and involved a lot of patience! 🙂 My advice to you would be to grab another table to have set up in your kitchen while you are working on your current one so that little hands wont be too curious! These are the items you will need: Small sponge roller, large sponge, base paint/primer, brush, glaze, white paint for white wash, and polycrylic glaze for the finishing coat. I started by painting the table grey. Initially I thought I would paint just the table top. But once the top was done I realized the rest of the table really needed a face lift so I painted the whole thing grey. I found this grey paint in the “whoops” section of the Home Depot paint department. The whole gallon was only $7! If you can try to find a paint that is a paint/primer combo to save you time. I simply rolled this on and was able to do a couple of coats pretty quickly. Make sure to let it dry between two applications. The trick of dry brushing is to get a small amount of paint on the brush and keep the strokes light and long. Try not to pick up the brush as you are making your strokes and work on sections at a time to try to match the same amount of texture. This gave me the wood look I was going for. My next step was glazing. Glaze can be bought clear and have any color added to it to a add a little interest to the glaze. Black paint was added to mine because I wanted to be able to highlight the design of the furniture with a darker color. This part could be done with a roller, and that would probably be easier, but my roller wasn’t available and the brush look was what I was going for anyway. Let the glaze sit for a couple of minutes and then wipe off with a damp sponge. The longer you let it sit the darker it will be. This was one of the trickiest parts for me because I wanted the streaks, but I wanted it to have a smooth finish all over the table. There times I had to let it dry and then go back to lighter parts and re-glaze them to match the darker places on the table. It wasn’t perfect, but I was okay with that too. This gives you an idea of what it looks like up close. Tada! I am really excited with how it turned out! Now I just need to refinish the chairs and pick a new fabric for the cushions. Trying to decide if I should do the whole covering the seats with plastic thing. I don’t love the look, but it makes so much sense with little ones running around. Let me know if you have any questions! I want to see your projects too! you may have already covered your chairs but I am about to do a similar project and did not want the plastic either. With 4 kids I needed some stain resistance. I bought oil cloth. It comes in a ton of print options, not too expensive but can wipe clean!! It has held up really well! I have had a couple instances when the paint was fresher that I didn’t remove a cereal bowl with milk below it that became stuck and pulled little bits of the paint. 🙁 so when the paint is new-ish keep an eye on that. The glaze was mixed with black paint and was actually left over from a neighbors project. To the eye it looked pretty black though. The white wash was actually using white paint mixed with water once my grey coats had dried. I still love it! I hope I answered all of your questions! I recently glazed some of our cabinets with an antiquing glaze that Lowes sells by Valspar that worked great. They ended up looking very similar to what you have here. I wanted something that looked “beachy” and was hoping that there would be some grain wood underneath when I sanded the table down because it is is a great table. I was shocked to find that it was a composite wood with no grain! That is why I used this hand brush technique to mimic what wood grain stained would look like.